↑ 1 2 3 Whitaker, Brian. Riot by migrant workers halts construction of Dubai skyscraper, UK: The Guardian (23 March 2006). Дата обращения 25 марта 2006. 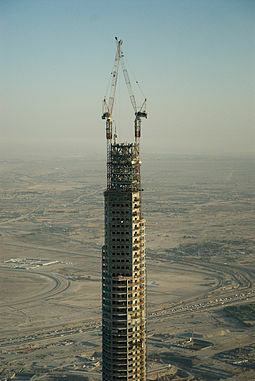 ↑ Burj Dubai opens tomorrow, final height still a secret!, India: The Hindu (3 January 2010). Дата обращения 6 января 2010. ↑ Emaar increases height of Burj Dubai; completion in September 2009, Emaar Properties (17 June 2008). Архивировано 10 июля 2011 года. Дата обращения 17 октября 2008.